It was a Thursday in June 2018 when Dr. Lisa Rae Gaither opened the doors to her AD&I practice for the first time. The path that took her there was anything but direct. 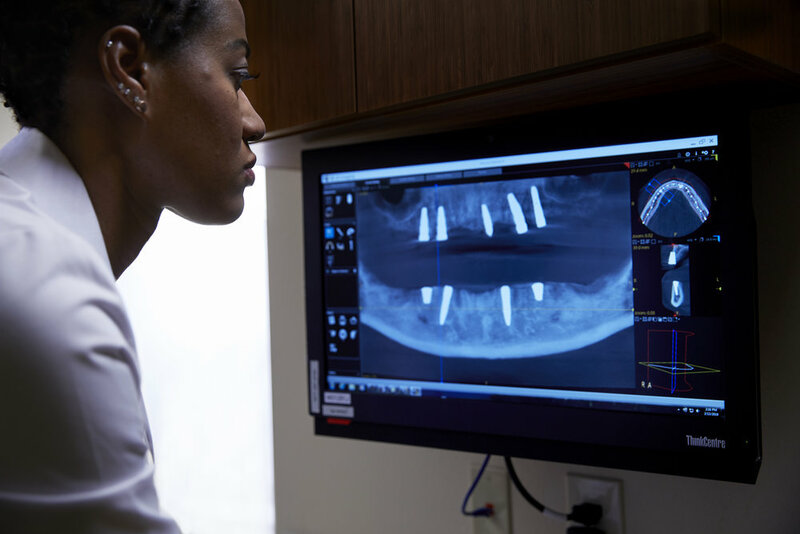 After graduating from the University of Kentucky’s College of Dentistry in 2014, Dr. Gaither had to make the first decision of her dental career; which way to go. Dr. Lisa Rae Gaither studying the CBCT of the upper and lower jaws of an implant patient with 2 BioHorizons Tapered Short Implants in the posterior mandible. Her career path took her in another direction, however, as she transitioned to general dentistry, then corporate dentistry in Arizona. She held a position with the Arizona State Prison System at Kingman, where many patients were beyond the point of restorative dentistry, and therefore, in need of extractions and dentures. There she was, fixing things again and her appreciation for this specialty resurfaced. From there, Dr. Gaither’s path led her to the University of Texas Health Science Center, where she treated children and emergency adult cases. The surgeries she performed here caused her to reflect back on where her love of surgeries began, the University of Kentucky; centered in a state with a high edentulous population, which provided extensive surgical experience for Dr. Gaither. And knowing that she wanted to focus on surgery, while maintaining complete clinical autonomy, she reached out to AD&I and only AD&I in December of 2017. Six months later as she opened the doors to her own practice in Winston Salem, NC, she was exactly where she was supposed to be. It felt good. And unpacking her bags at this destination brought a smile to her face. Dr. Gaither speaks with Lab Manager, Aaron Taylor as he uses the Ivoclar IvoBase Injection System. That smile has seeped into the culture of her practice and is constant when she interacts with her patients. “Whenever I walk into a room, I come in with a smile,” Dr. Gaither says. And patients notice. Veetra Martin did. After a part of her tooth broke off, Martin called Affordable Dentures & Implants in Winston Salem on the day of the practice’s grand opening and became one of Dr. Gaither’s first patients. Martin, like Dr. Gaither, is also in the medical field. As a Certified Nursing Assistant, Martin interacts with patients every day and believes her smile is a necessary component to doing her job well. 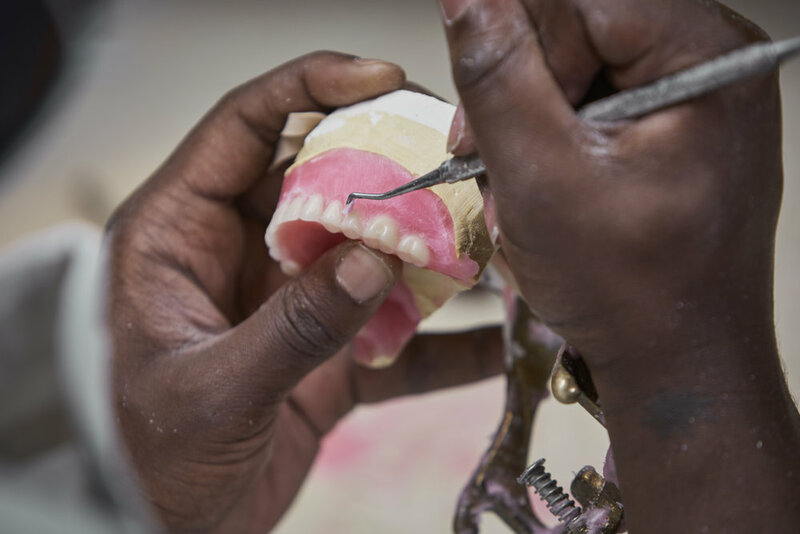 When she broke her front tooth in the spring of 2018 the way she approached her work changed. Friendly, caring and spunky, Martin, a self-proclaimed “smiley person...a toothy person,” distanced herself from people, turning her head down and away from patients as she interacted with them. She was not herself and it was affecting not only her confidence, but also her ability to encourage and support her patients. “You can't uplift someone if you can't smile yourself,” she says. Realizing the value of her smile is what brought Martin to AD&I. Nervous at first, Martin was put at ease right away by the smiling staff, specifically Dr. Gaither and Daphne Rena Henry, the practice’s Front Desk Assistant, whose own memorable smile lights up any room and anyone around her. And it was. Dr. Gaither spent time with Martin, examined her and recommended they extract the teeth of her upper jaw, as she had many fractured teeth. A proponent of saving teeth when you can, this was the best option for Martin, and she trusted in the recommendation. “If you don’t trust your doctor, there's no doctor-patient relationship,” Dr. Gaither says. AD&I Lab Manager, Aaron Taylor, customizing a denture in the on-site lab. Martin had her impressions for her immediate dentures, followed by her extractions and, within a few hours, was officially a denture wearer. And the results were well received by all. “Her denture...I mean, wow!” Dr. Gaither says. “It looks so good on her. It's a very natural look and it’s immediate." With her smile back, she’s back to herself again. Nine months later, Gaither is settling into life as a practice owner extremely well. In February, through her doors walked in Mary Sitas and her son, Travis. Daphne Rena Henry, FDA, greeting patient Mary Sitas as she arrives for surgery. For 14 years the medications that Sitas, 63, had been taking caused dry mouth, tooth decay and tooth loss. After more and more teeth and fillings kept falling out she finally had enough, and decided dentures were the best option. Sitas sat in the lobby with her oldest son, Travis, preparing herself for the extraction of 19 teeth, while excited at the thought of finally feeling comfortable smiling. Jenny Jimenez, DA and Dr. Lisa Rae Gaither prepping Sitas for surgery. Gaither makes a great effort to get to know her patients, is approachable and, first and foremost helps them to feel comfortable. Henry echoes this, stepping in as an additional source of comfort. “I told [Sitas] that it will be just like having training wheels on your bike; I won’t let you go until you're ready...I’m here,” she says. It’s surprising to many that Henry, whose beautiful smile takes your breath away, is a denture wearer herself. She tells her own personal story to patients; that story, along with that standout set of pearly whites, helps turn patients’ nervousness into readiness. After the extractions, Sitas received permanent dentures the same day. 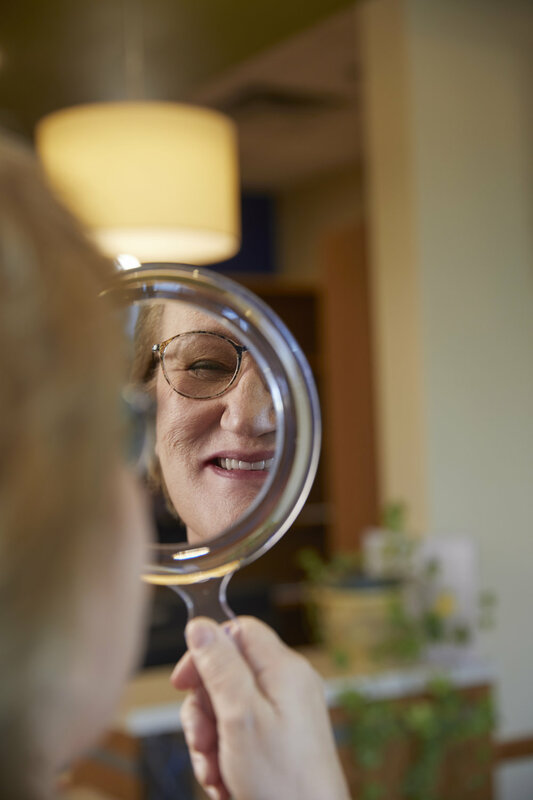 When Dr. Gaither handed her a mirror she couldn’t stop looking. She was beaming. Two weeks after receiving her dentures, Sitas reports that life is good. Really good. Out of habit, Sitas still puts her hand in front of her mouth though. Martin and Sitas are just two of hundreds of patients who have received new smiles and a huge jolt of confidence all because of the Winston Salem AD&I practice. The environment here is centered around smiles, stemming from the genuine care and compassion that Dr. Gaither and her team provide their patients. It’s a ripple effect. And it all started with Dr. Gaither. Though she helps people physically, emotionally and socially everyday with the work that she does, Gaither isn’t stopping there. Her career inspires her to do more. Dr. Gaither will celebrate her first anniversary as an AD&I practice in June. Her decision to join AD&I was not made lightly. Rather, exploration took her there. Through all of her experiences in corporate dentistry, general dentistry, and higher education clinics, her passion for surgery was steadfast. And it brought her to AD&I where she was able to do both what she loves and what she does well, helping to change the lives of patients like Martin and Sitas every single day.